Have you ever needed to calculate the square root of 43 wile checking out at the grocery store? Yeah, me neither. But you know what I have done in grocery stores? Googled mysterious ingredients on my phone. 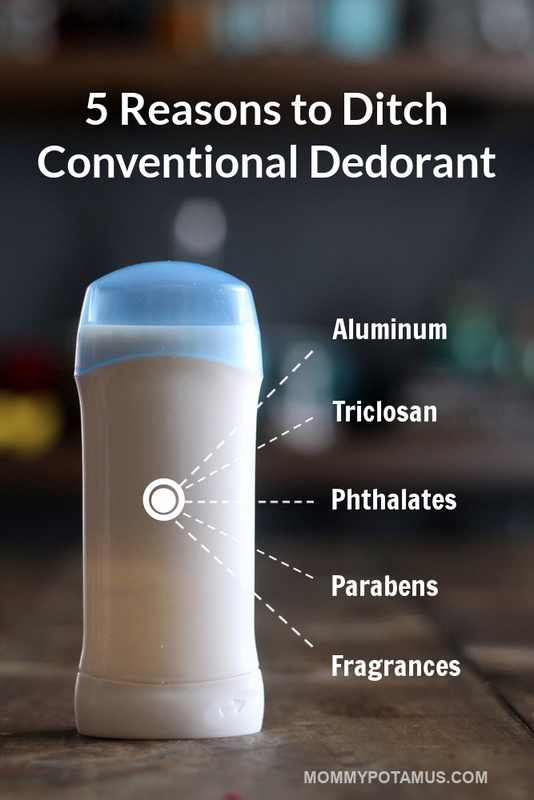 I’ve already shared with you my man-stink killer deodorant recipe along with my sensitive skin formula and my fave pre-made option, but is deodorant bad for you? Despite the fact that they’re added to food, personal care products, and household cleaners, many of these chemicals have never been tested for safety. (source 1, source 2) When I realized that, I began switching over to products free of synthetic chemicals, starting with the products I use most often. Because it was so easy to replace and there were definite concerns about its use, deodorant was the first to go. 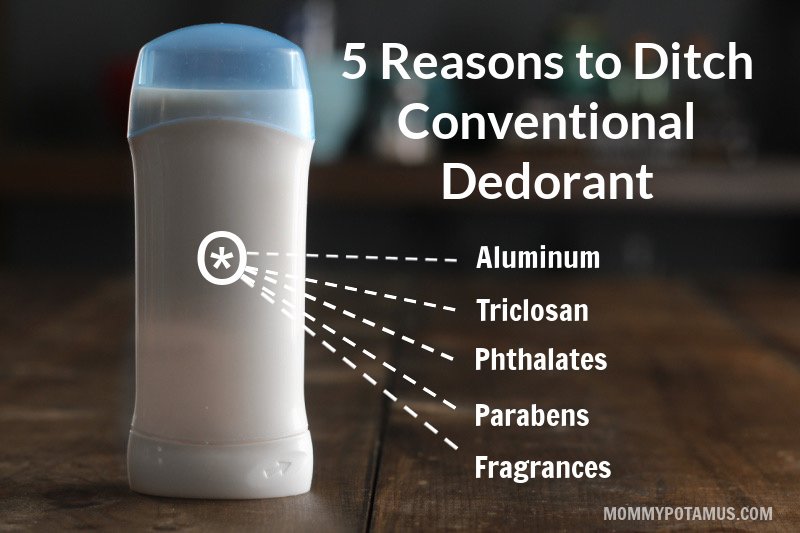 Here are are the top five reasons I ditched conventional deodorant, and why you might want to consider doing it, too. Many deodorants and antiperspirants – including some “natural crystal” deodorants – contain forms of aluminum, which inhibit perspiration. This controversial ingredient is classified in this review, which was written by an oncologist, as both a genotoxin and hormone disruptor. Ahh, Triclosan, the ingredient Minnesota banned over concerns that it may contribute to the development of superbugs. Studies indicate that this chemical, which is used in everything from toys to toothpaste, may disrupt normal thyroid function and alter hormones. I’ll pass, thankyouverymuch. Propylene glycol (PEG) is a penetration enhancer, which means that one of the things it does is help other chemicals get deeper into skin. So yeah, there’s that. And also, it is classified as a moderate hazard by the Environmental Working Group. Thanks to a loophole, companies can hide all sorts of nasty chemicals under the label “fragrance” without disclosing them. In one study conducted by the Environmental Working Group, nearly half of the ingredients in the fragrance products they tested were not listed on the label. I promise, it’s easier than you probably think, and homemade deodorant really does work. In case you need them again, here’s my three-ingredient original recipe, my sensitive skin recipe, my solid deodorant recipe which also works for sensitive skin, and a pre-made option you can buy. I’ve also got a stick version coming out soon. Once you’re ready to tackle the next thing, here are a few other products you might want to replace: toothpaste, foundation powder, shampoo, lotion and soap. 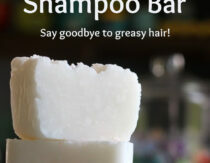 Do you have any tips for making the switch to non-toxic personal care? Please share in the comments below! My favorite place to purchase natural safe body care products is from Etsy. The Green Rift is my favorite place to get all of my body care needs! The owner is Jen and she is super awesome! My switch actually went pretty easy, just used up the conventional deodorant and started with natural one. 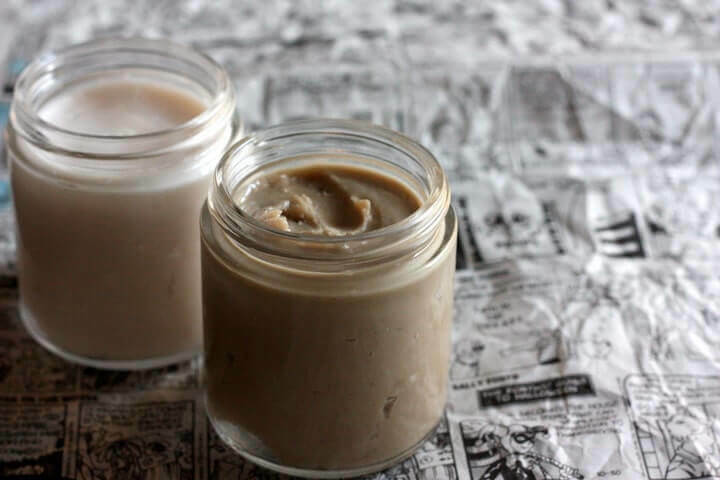 I haven’t made my own, though – purchased Primal Pit Paste and it has lasted me for an eternity..actually can’t wait to make some myself. I think it was roughly a week that my skin needed to adjust and “stink” less. I would advise to give it a week or two, before saying it doesn’t work (my partner tried for two days and went back to his conventional one, although he approves of me using mine – must mean I’m not stincky-wincky:D). I would advise to give some natural products, deodorant for example, some time to show its true colours:) And something that I want to do myself – try different products, different recipes and don’t be afraid to tweak them to fit your skin:) Because at the end of the day, it’s awesome to use natural stuff! And I forgot to add – I had no idea about the fragrance loophole.. Thank you! I ditched my deodorant almost a year ago. Once I found this recipe I have had no problems at all. When you first quit it can be pretty stinky as the toxins leave your system. Now I am almost as stink free as I was prepuberty. I can go almost 24 hours without reapplying. I switched to making my own deodorant like…9 years ago. Wow I’m getting old. Anyway, I eventually got lazy and had enough success not using it at all that I stopped. The natural deodorant made the transition easier! My problem is that I HAVE to have antiperspirant! If I don’t, then I get terrible heat rash. There are a lot of options for just deodorant, but I have not found any healthy options for antiperspirant. Most natural storebought deodorants (at least all the ones that I’ve ever seen) are just that — deodorants, NOT antiperspirants. So, while they may keep you smelling nice, they don’t help at all in keeping you dry. And I hate that. What I’ve found, however, is that many — if not nearly all — homemade deo recipes use baking soda, arrowroot powder, or cornstarch to help absorb moisture much like aluminum does in conventional antiperspirants. I was QUITE leery that these powders could actually rival aluminum in their effectiveness but I’ve been using homemade deo that a friend gave me for months now and I actually preferred prefer it hands-down to any of the other natural storebought does that I have. Seriously, it’s amazing!! And that’s coming from a serious former-skeptic! Anyway, give a batch of homemade a try — maybe make a half batch the first time to see how you like it. 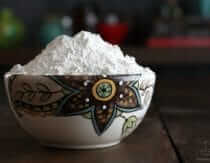 There are LOTS of recipes online, and several for baking soda free varieties if you find that you are sensitive to that. Best wishes to you in your search! Hi Cynthia, I discovered that my heat rash was created by wearing synthetic fibers. Once I switched to breathable fabrics (including my bra), no more rash!! Cynthia, I’d be interested to see if a recipe with arrowroot powder (or cornstarch) helps you as it wicks away moisture. Many people who have tried mine have reported noticeably reduced sweat factor. If you’re interested in trying it, send me a message on the FB page Barefoot Body. So I see a lot of recipes or diy deodorant. But odor isn’t my problem. Perspiration is. So how do I get out of the normal ingredients in deodorant/antiperspirant but still have something to help with the sweat? I can’t just not have antiperspirant or I would never go out in public when it’s warm. I was worried about that too – I would reapply my commercial antiperspirant/deodorant several times a day because I was sweating. After I switched to the natural deodorants I actually sweat a lot less. I think it was my body saying it didn’t like all the chemicals I was using! The baking soda/arrowroot powder/cornstarch in homemade deos helps immensely with absorbing moisture (but not in inhibiting its release the way that that nasty aluminum in conventional antiperspirants does). I was super skeptical at first, but they really do work! It’s amazing! I would suspect that it is not the sweat that is irritating your skin but something that your body is pushing out. You could try supporting other ways of getting toxins out of your body like saunas, oral chelation (coconut oil pulling) and probiotics. Bottom line it should just be a phase. OR if you’re shaving your armpits with a razor blade, maybe try switching to an electric trimmer to minimize breaking the skin? I became allergic to all the deodorants on the market. Then remember about bicarbonate of soda. Dust it on after a shower and not even a wiff! Best thing I ever done! I ditched mine when I found out my cousin got Breast Cancer. 3 days before, she found out she was pregnant. She had to deliver at 31 1/2 weeks because the treatments weren’t working. She still has the cancer and has lost too much weight. She’s still getting treatment but the pain is getting worse. If you care about anyone, change deodorants. Granted the Aluminum free doesn’t keep smell down too much but, think of my cousin & her struggle, while with a 10 month old she can’t even pick up. I do every time I put my deodorant on. I ditched deodorant a number of years. I have opted for no-odor stainless steel. I do get the occasional body odor on a highly stressful, or active day, but it seems to be less noticeable the longer I am away from the chemical deodorants. 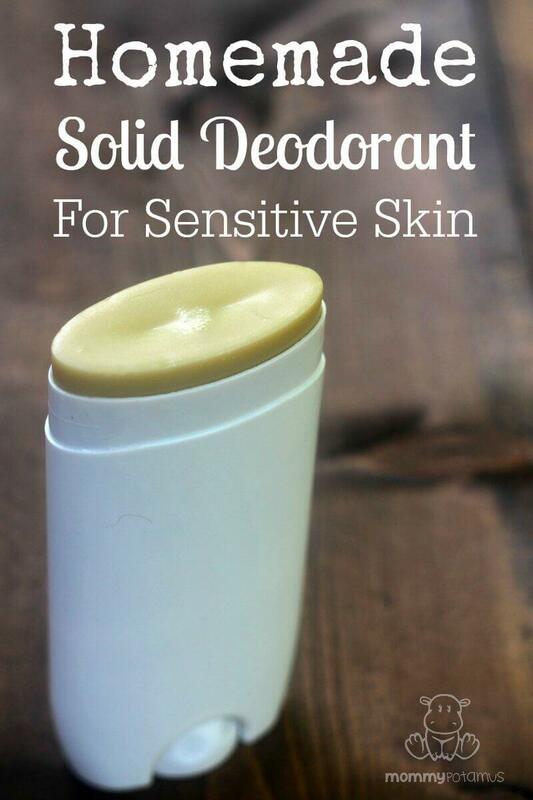 I just made your sensitive formula for homemade deodorant. I have had no problem with smell but am terribly broken out under my arms. Any suggestions? Are these deodorants good for excessive sweating? Mix equal parts of Bragg’s organic apple cider and distilled water. Use cotton pads to wipe on your armpits (morning and night). I never knew these things. I think aluminum is the worst case.